If the employee is not in a retirement plan then all fields will display as blank, with the system date in place as the effective date. If the employee is terminated the last effective date where changes were made will display, with all selections present, however the “Current Retirement Plan” will not display any value. If the employee is active and in a retirement plan, the most recent effective date will display with all selections made on that date, and the Current Retirement Plan will display to match the one entered on the page Retirement Plans in the Enroll in Benefits menu tree. 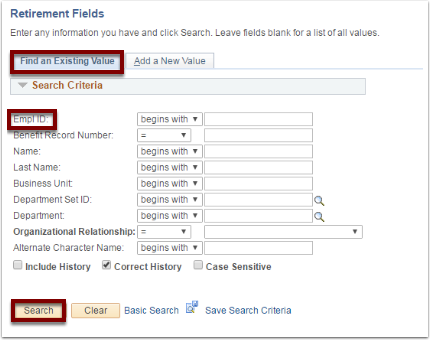 New hires (or people who have had changes in their retirement that effects these reported values) must have their information entered into these fields manually as nothing will default into the fields other than Current Retirement Plan as that is a PeopleSoft value from another page. NOTE: Retirement Fields needs to be maintained so that downstream reporting will be accurate for DRS and TIAA-CREF, but this does not affect the actual retirement deductions if fields are left blank. Refer to Dates on Retirement Plan Pages QRG.